NSPA has always striven to grow, to diversify and accomplish more. So, from having just a handful of artists and venues in our kitty, we now support over 50 artists and perform at more than 20 places in the city. With each passing day, the team strives to double its efforts, so that the joy of art can be spread to one and all. We must say, our efforts have been quite successful! It’s time NSPA enjoyed another success. A really big one this time. After months of planning and organizing, the NSPA has succeeded in launching its ‘Bringing Art to the People’ initiative in Goa! 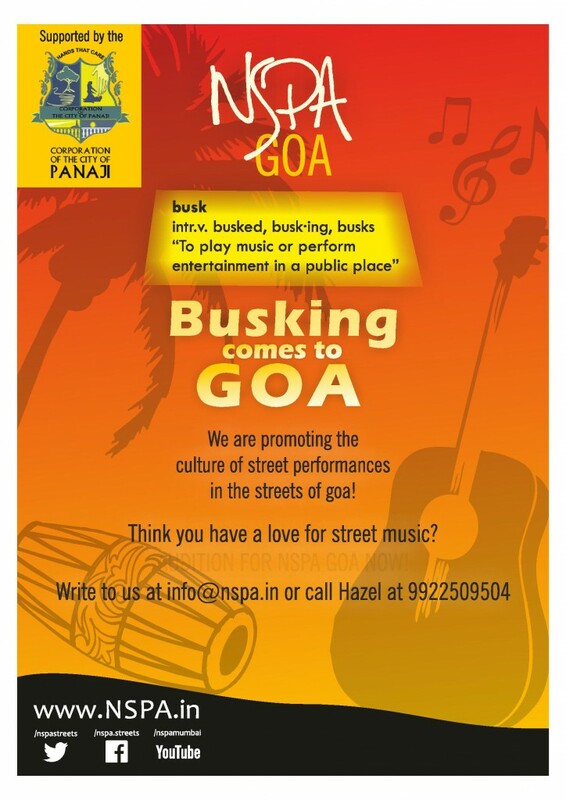 Yes guys, the NSPA will now be organizing street performances in Goa. We’ve roped in local artists to perform at some popular public spaces in Panjim city like the Kadamba Bus Stand, Panaji Municipal Market and at the Garden Square Junction. A big thank you is rightfully due to the CCP (Corporation of the City of Panaji,) especially Mr. Sanjit Rodrigues, the Commissioner, for granting us the required permissions and welcoming us to Goa. For now, performances will be held on Thursdays, Fridays and Saturdays. So, if you happen to be in Goa on any of these days, do visit our venues to listen to our artists perform. Excited for us? Then help us spread the word about our launch. If you have friends or relatives in Goa, tell them about NSPA. Also, if you know of any budding artists in Goa who are eager to showcase their talent, ask them to drop us a mail so that we can get in touch with them. We are hoping to make our Goa launch as successful as our initiative in Mumbai. Fingers crossed! NSPA brings Indie Power to Marico Evenings!